Iran gets ready for its (possible) final match of the World Cup and Iranians worldwide prepare to party hard in support of their team regardless of the outcome. Some friends were confused with our support though, can you support Fifa world cup games knowing the abuse some of the poorer Brazilians suffer in these games, or the immense death toll of the upcoming Qatar games? Well, in Iran supporting the games and the national team is not only a national pastime, it’s also a political act in and of itself. After the Iranian revolution of 1979 various sports (such as boxing and chess) were banned, and others discouraged. While sport has blossomed in the decades since, it’s still not easy being an athlete or a supporter, especially if you’re a woman (as exampled here). And still, in a country where so much public displays of joy are still banned, taking to the streets after a game is still a rare occasion to party outside, and it’s not uncommon that some of these celebrations turn political when supporters start to chant political slogans against their government. While the 2014 games are played in Brazil it’s not less of a headache for a government trying to impose strict morality laws. The entire opening with performances of Jennifer Lopez and other scantily clad women was blacked out on national TV. But even players and supporters in Brazil have to be carefull since the government has send officials who will report on unislamic behaviour. Not that such policing has actually stopped fans from going to the games and show themselves in full glory (more pictures here). 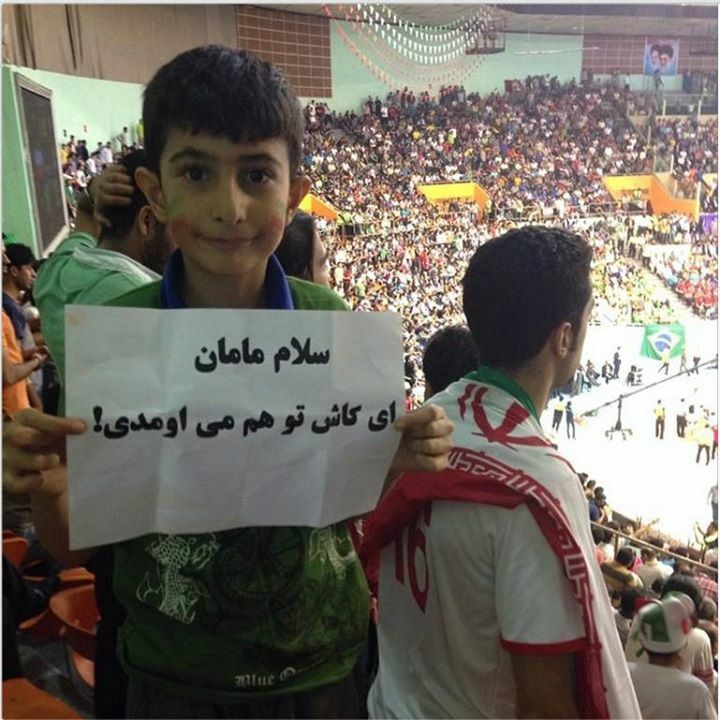 During the same time as the Football World Cup Iran hosted Volleyball games in the Teheran Azadi stadium. For women fans this meant enduring the same trials and ordeals. When Brazil played they dressed up as Brazilian fans and a few made it in (foreign women are allowed to participate, since banning them would give trouble with international regulations, though officials claim they are allowed in since they cannot understand the harsh language of Iranian supporters). In the next match attendance of anti-riot forces was strong and women had been arrested and released after spending days in jail. The affair has drawn comments from officials such as the head of Iran’s Volleyball Federation who pointed out that the female employees of the federation were allowed to enter and keeping the women supporters out hurts the international standing of Iran. Even Iranian president Rohani has commented that such a ban should be reversed and has charged officials with looking into possible ways to do so.